Decon Engineering (Pvt) Limited Pakistan. Descon Engineering Limited is an integrated engineering services and manufacturing company operating in Pakistan and the Middle East. We are in the business of delivering client-specific solutions for projects related to Energy, infrastructure and Process industry. The integrated package of services encompasses engineering, procurement, manufacturing, construction, commissioning and maintenance. 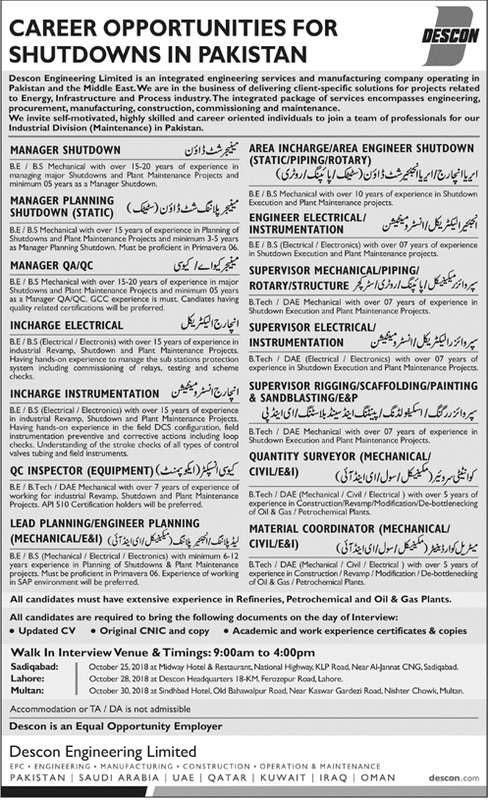 We invite self-motivated, highly skilled and care, oriented individuals to join a team of professionals for our Industrial Division (Maintenance) in Pakistan. (I) All candidates must have extensive experience in Refineries, Petrochemical and Qil & Gas Plants. (II) All Candidates required to bring the following documents on the Day Of Interview. (III) No TA/DA will be admissible. Sadiqabad: October 25, 2018, at Midway Hotel. Lahore: October 28, 2018, at Decson Headquarters. Multan: October 30, 2018, at Sindhbad Hotel.